A chimeric antigen receptor (CAR) T-cell therapy consisting of 2 distinct constructs, one targeting CLL1 and the other CD33 (CLL1b-CD33b compound CAR), showed a complete remission with minimal residual disease (MRD) negativity in a single-patient case study from an ongoing phase I study for relapsed/refractory acute myeloid leukemia (AML), according to first-in-human findings presented at the 2018 EHA Congress. “Our findings indicate that targeting both CLL1 and CD33 on AML cells may be an effective strategy for eliminating both AML bulky disease and leukemia stem cells that may potentially prevent relapse due to antigen escape or the persistence of leukemia stem cells,” said lead investigator Fang Liu of the Hematology Department of Chengdu Military Hospital in Chengdu, China. The CAR T cell construct was specifically designed to prevent the development of resistance that is often observed in patients with AML. CLL1b-CD33b cCAR consists of 2 individually complete CAR constructs connected by P2A, a self-cleavable peptide linker. Both CARs contain a CD8 leader sequence to help enhance expression and the first CAR, which targets CLL1, is fused to a spleen focus forming virus promoter (SFFV). The CLL1 CAR has a CD28 activation domain while the CD33 CAR has a 4-1BB domain. Both have CD3ζ signaling domains. Transduction was accomplished with a lentiviral vector. The case study presented at the EHA meeting was for a 44-year-old female patient with relapsed/refractory normal karyotype AML-M4. At baseline, the patient had 71% blasts and was treated with 4 cycles of standard chemotherapy, after which the blasts dropped to 47%. Two months following chemotherapy, the patient underwent lymphodepletion with 3 doses of fludarabine at 30 mg/m2 and cyclophosphamide at 500 mg/m2. Before introduction of the CAR T-cell therapy, blasts were at 20%. The CAR T-cell therapy was administered at 7 x 105 CAR+ T cells per kilogram. Nineteen days following infusion, the patient tested MRD-negative. At day 44, she received a matched-sibling donor hematopoietic stem cell transplantation, and continued to test MRD-negative at months 1, 2, and 3 post transplantation. “CLL1-CD33 compound CAR-T therapy could be developed as a ‘bridge to transplant’ as a supplement to chemotherapy, or as a stand-alone therapy for patients with aggressive, relapsing/refractory acute myeloid leukemia,” Liu suggested. Following infusion of the CAR T-cell therapy, the patient developed grade 1 cytokine release syndrome (CRS), consisting of high fever and fatigue, which was self-limiting and resolved without treatment. The patient's temperature reached 103.1°F (39.5°C), which also coincided with peak increases in IL-6. There were also marked jumps in IL-8 and TNF-alpha. Additionally, CRP and ferritin levels each spiked at days 13 to 18 following infusion, coinciding with the CRS. 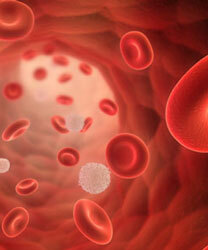 There were marked changes in other hematologic counts, resulting in pancytopenia, Liu noted. Both whole blood counts and platelet counts began to decline following infusion of the CAR T cells. These drops resulted in a lung infection that was controlled by antibiotics. The patient remained red blood cell transfusion dependent at the time of the analysis, although platelet transfusions were not required. Available data have not raised safety concerns, although CLL1b-CD33b compound CAR was designed with a CD52 safety switch. With this mechanism, the monoclonal antibody alemtuzumab (Campath) could be administered for rapid termination of the CAR-T therapy in vivo. This safety switch was successfully tested in preclinical trials, which preceded the phase I trial. In addition to tests of the safety switch, the compound construct underwent extensive in vitro investigation on multiple AML cell lines, primary human AML samples, and in REH cells, which express either CLL1 or CD33. The construct was also evaluated for anti-leukemic activity by injecting mice with REH expressing CLL1 or CD33 or the U937 cell line prior to transplanting the compound CAR T cells. In the United States, the FDA has approved 2 novel CAR T-cell therapies, each targeting the B-cell–specific CD19 antigen. The first CAR T-cell, tisagenlecleucel (Kymriah), was approved in August 2017 for patients up to age 25 years with B-cell precursor acute lymphoblastic leukemia. The second agent, axicabtagene ciloleucel (Yescarta), was approved in mid-October 2017 for patients with certain types of non-Hodgkin lymphoma. “Although the single compound demonstrates strong efficacy, in AML resistance and disease relapse may occur due to the presence of heterogeneous cells that can offset killing by single CAR-based therapies,” said Liu. In general, targeting both CLL1 and CD33, which are highly expressed in AML, could help avoid antigen escape, making it an ideal target, Liu said. The phase I study exploring CLL1b-CD33b compound CAR continues to enroll participants. The primary objective of the study is to evaluate the safety and anti-leukemic activity of the compound CAR T-cell therapy. The trial plans to enroll a total of 20 patients with relapsed/refractory AML. Liu F, Pinz K, Ma Y, et al. First-in-human CLL1-CD33 compound CAR T cells as a two-pronged approach for the treatment of refractory acute myeloid leukemia. Presented at: 2018 EHA Congress; June 14-17, 2018; Stockholm, Sweden. Abstract S149.